Time is a lot of the things people say that God is. There’s the always preexisting, and having no end. There’s the notion of being all powerful—because nothing can stand against time, can it? Not mountains, not armies. And time is, of course, all-healing. Give anything enough time, and everything is taken care of: all pain encompassed, all hardship erased, all loss subsumed. Ashes to ashes, dust to dust. Remember, man, that thou art dust, and unto dust thou shalt return. And if Time is anything akin to God, I suppose that Memory must be the Devil. 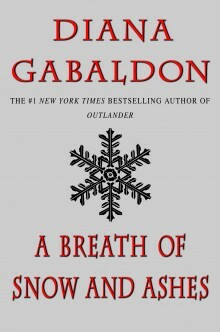 That’s the Prologue to A BREATH OF SNOW AND ASHES, the sixth novel in the bestselling OUTLANDER series of major novels (following THE FIERY CROSS). Here, history once more catches up with the Frasers, and Jamie is at last obliged to declare himself a rebel, though this means the sacrifice of much of what he’s built. The American Revolution is a civil war, with neighbor turned against neighbor, and the community of Fraser’s Ridge begins to fragment. The fragile veil of law is rent, and bands of roving men ravage the land, stealing, burning, and destroying, often not bothering to shield their actions behind the curtain of politics. One day, such a band comes to Fraser’s Ridge; Marsali (Jamie’s step-daughter) is attacked, and Claire is taken. The violent aftermath of this act leaves a trail of damage in its wake, the first of a series of shocks that shakes the community on Fraser’s Ridge. The next such shock shatters peace and community, and leads to the arrest of Jamie and Claire, and their departure for New Bern, the seat of government and the only tenuous source of law left in the colony. Meanwhile, Roger MacKenzie, husband to Brianna, Claire and Jamie’s daughter, has made a place for himself in the 18th century, and after many trials and setbacks, has found his vocation as a Presbyterian minister. On the eve of his ordination, though, he receives word that his wife has been abducted by Stephen Bonnet, and at once abandons his plans to go and rescue her, with the aid of Jamie and Young Ian. There is no law now, save that which a man makes for himself, and there is a bloody confrontation on the island of Ocracoke. Pirates are not the only thing on Ocracoke. The island is the site of a small standing stone circle— a place that brings one strand of the story to a moving conclusion. This page was last updated on Tuesday, December 1, 2015, by Loretta, Diana’s Webmaster.